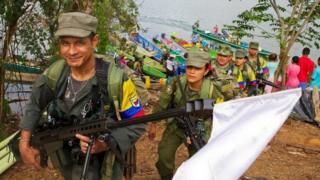 The last 300 members of Colombia's largest rebel group, the Farc, have arrived in their transition zone to disarm. Farc negotiators signed a revised peace deal with the Colombian government on 24 November to end more than five decades of armed conflict. Under the accord, the rebels agreed to move into 26 transition zones. Most of the 6,900 rebel members arrived on foot, by bus and boat travelling long distances from jungle camps. The rebels have been complaining that the transition zones have not been finished yet and in some cases the fighters had to set up camps themselves. In a remote rural area in the Cauca province in western Colombia some 300 Farc fighters live in two camps and some, like the highest-ranking guerrillas and some pregnant women and mothers, live in a more comfortable area, with some proper buildings and some shacks, and actual showers - one even with warm water. None of the structures were built by the government or with government-provided materials. The area where those buildings should be was still just a flattened patch of land in the middle of a forest. Last I heard, half a tonne of concrete had arrived. Some fighters were taking driving lessons taught by a Farc instructor, others participated in workshops on gender politics while they waited for the government-provided training to begin. They play football, volleyball, read, watch movies and when the night comes play games, for example, one similar to a pub quiz, where points are earned by answering correctly questions about the history of the Farc. The general mood is one of calm and expectation. When asked about their main worry every one of them says: "That the state doesn't fulfil the agreement." The government has blamed the delays on the difficulty of the terrain in many areas and the lack of road access. But the UN mission in Colombia has called on the government to delay the timetable set out under last year's peace accord to hand over their weapons. In a leaked letter to the government and the Farc, the head of mission, Jean Arnault, said there was nowhere safe to collect weapons as the rebels disarmed in camps that remained unfinished. "The majority of camps have not been finished and have not been demarcated with precision," he said. "This could result in a grey area which could allow for different interpretations and lead to incidents." Mr Arnault also said many Farc members were concerned for their personal safety and their "socio-economic and physical well-being". He called on the government and the Farc to meet UN Mission officials as soon as possible to evaluate the "real situation" of the camps. The rebels are expected to stay in the transition areas until 31 May. They are due to be registered there and be prepared to reintegrate into civilian life.